04 Boys Black are the Undefeated Champions at the Mid-American Soccer Classic Tournament! 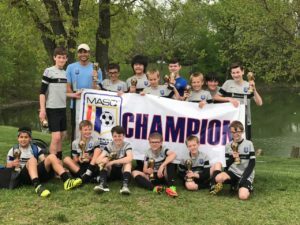 The CSC 04 boys Black were undefeated Champions in the silver division of the MASC tournament in Fairfield, OH the weekend of April 22-23, 2017. Coached by Austin Moman, the boys entered the championship game undefeated. Substitute coach Isaac Hayes stepped in for Moman Sunday due to a schedule conflict. The boys came back from being down 2-0 at half time and tied it up in the final. After double over time CSC boys won 5-4 against CW Inferno in PK’s.